Bob Zito brings an interesting perspective to the chase for the Amazon HQ2 project — and the series of unending reports speculating on what is going to happen and the questions of whether Amazon has lost control of the narrative surrounding the economic development story of the century. “I think Amazon may be sitting back and laughing at all of this,” he said. 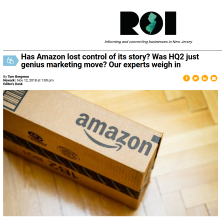 Zito, the head of Zito Partners in Warren, is not involved in the marketing of the project, but as the former head of marketing, branding and communications at Sony, Bristol-Myers Squibb and the New York Stock Exchange, he understands what is going on internally at Amazon. And he thinks the top leaders simply may be humored by the recent surge of stories on the subject. “One thing that everyone jumps at whenever there is a story out that’s not supposed to be out yet is that the company is losing control of the messaging,” he said. “When you’re inside a corporation, you never want to do that. When its second headquarters project was announced 14 months ago, Amazon said it planned to make a $5 billion investment and bring 100,000 six-figure jobs to the winning municipality. The announcement set off a flurry of interest unlike anything seen before, as municipalities publicly (and privately) pitched themselves. Since Amazon announced a list of 20 finalists (which included Newark) in January, there had been few reports on the progress. In the last two weeks, however, there has been a flurry of activity, including reports the project will be split among two winners — and those winners will be Northern Virginia and New York City. Amazon has not commented publicly. Zito thinks that’s a good move. And it’s not just a matter of all press is good press, he said. You want good press, he said. And Zito said this is good press. Much of the conjuncture has been that Amazon pulled a marketing ploy — that the company knew from the start it was going to split the winning bid. Jay Biggins, the executive managing director of Princeton-based Biggins Lacy Shapiro & Co., has felt that way from the start. Biggins compared the effort to a charity auction. “You know when somebody’s vacation house is being is auctioned for a week in August and they get the auctioneer to get the bidders up to an obscene level — and then they say the owner has authorized us to offer a second week if the losing bidder would agree to the same bid for the second week,” he said. Chris Paladino, the president at the New Brunswick Development Corp., said Amazon always was going to do what was best for Amazon. And, from the start, Paladino said, splitting the project among numerous cities along the Boston-Washington corridor made the most sense. “Access to a trained workforce is the No. 1 reason companies locate to a region,” he said. And while that would favor Newark and New Jersey, the second scenario Paladino mentioned clearly benefits the Northern Virginia bid. “The second can be if the owner happens to live there, is renovating an extraordinary home around the corner from a former president and owns a newspaper in the city,” he said. This, of course, begs the question: Was the process loaded from the start? “My gut is Amazon is simply going through the process that they outlined internally and are sticking to it,” he said. As for the leaks, he said they could be more fantasy than fact. Zito said the marketing heads are smart enough that they are not going to allow this to backfire on them. If anything, he thinks the cities clamoring for their business are the ones who may need marketing assistance.